Theatre group PVR Cinemas has launched an app for iPhones, iPods and iPads, after launching one for Android-based handsets. 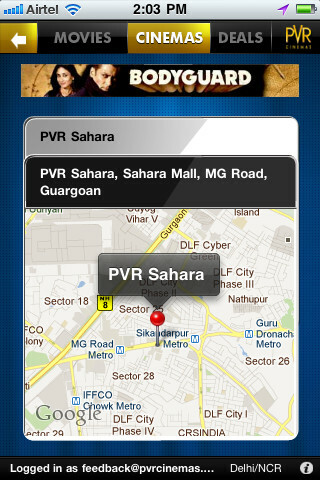 The app allows users to check show times of movies, select seats and book the tickets on the go. Plus, it has trailers, movie posters and deals to entice users. Users can locate the nearest theatre using the map. The app requires you to register to PVR Cinemas but (thankfully!) offers a Facebook Connect option as well. The BSE-listed PVR Limited has a chain of 154 screens in 35 multiplexes in 20 cities in the country. It plans to grow its reach to 40 cities and 300 screens. Users have a plethora of choices when it comes to booking a movie ticket - there are apps that let you book tickets on all of them - Big Cinemas, INOX, FUN Cinemas and PVR. Website BookmyShow, after partnering with payment providers such as Itz Cash Card's NoQ24x7, Beam Suvidha and telco Vodafone, also has its own application now. Then there are third party prepaid card firms such as Paymate, Obopay and NGPay that offer ticket booking along with other services such as recharge of your cell phone account or DTH service and utility bill payments. By launching its own app, PVR Cinemas may be attempting to get users to show their loyalty towards its chain, and is rewarding them with discounts in return. But will it suffice?